Cost is $40 for this VIP tour, which includes light snacks plus entry to the movie screening of RiverBlue at The Plaza at 7 pm afterwards. Register at www.fashionrevolutionyycca.com. Join us on Friday, April 26 for a VIP Makers Tour (35 people) that will go around Calgary to visit local Makers’ studios. During the tour, participants on the bus will see how clothing is manufactured and dyed, and woven, and designed! 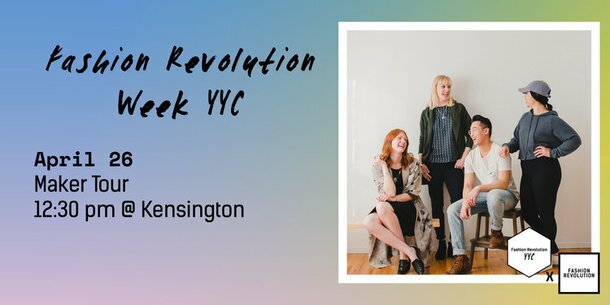 We will stop in at a 5 amazing studios throughout Calgary where all of this creativity is happening, and then the evening completes with the group getting dropped off at a documentary screening of The River Blue movie at the Plaza Theatre in Kensington.